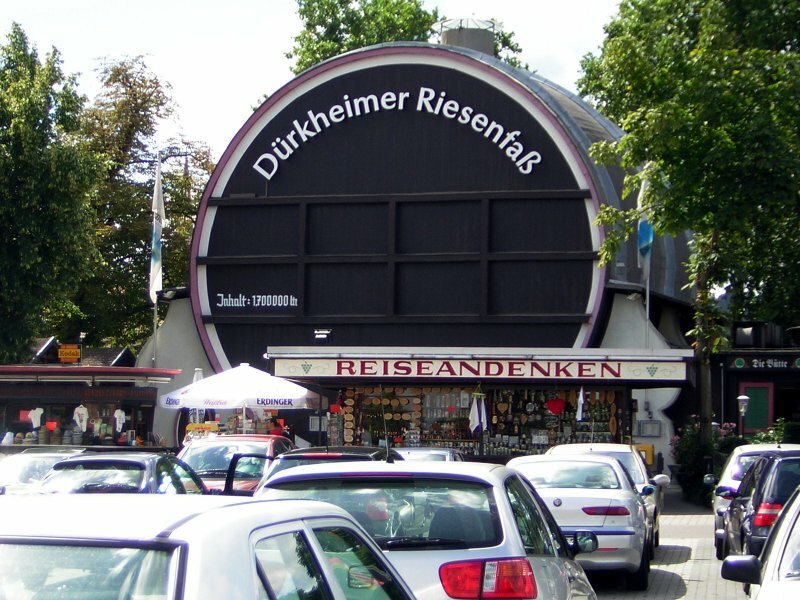 Recently, another blogger I follow took note of the Germans’ penchant for pork. Took issue with it, really. And, while I think taking aim at another cultures’ tastebuds is a thorny undertaking at best, I do feel a little sympathy for other people who are swine-averse in Germany. There’s no easy way to steer clear of the pig when in the Palatinate. And I should know. I am not a sausage eater. I don’t mind the aroma, the spice, the bite of garlic or pepper–those are all fabulous…seductive, even. Not sure I like the idea of sausage, but sausage is not really one of those things anyone should think too closely about, so that’s not the problem. I’m just allergic to pork. So I avoid it. No biggie. Up to this point in my life, there have always been lots of options. In the South, I go to BBQ joints and order shredded chicken or beef. I take a pass on bologna, and I feel no great loss. 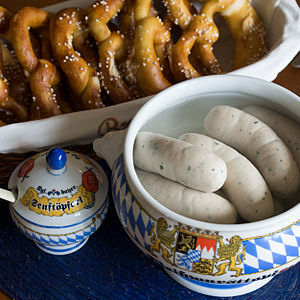 However, in the land of beer and brats, you find yourself adrift on a sea of sausage… absolutely schwimming in schwine. The boys in my family think this is fabulous, and I won’t contradict them. But it does make for some awkward moments for me. I feel funny always asking what’s in a dish that I don’t recognize–it feels a little high maintenance. And, since my German is very rudimentary, I often don’t understand the answers I get back. So there’s a lot of just steering clear–taking the widest path around anything that might possibly contain pork. So here’s the plan: Germany may be a swine-fest 24/7, but it’s also a chocolate and pastry and spatzle fest, so I will not suffer (although my waistline might). My household will savor all that Germany has to offer by the age old “Jack Spratt technique.” What I won’t eat (pork), my husband will relish; what he will only nibble around the edges (pastries), I will greedily gobble. You’ll recognize us if you sit nearby at a restaurant: we’ll be the people who’ve licked our platter clean. *A wurst is a German or Austrian sausage–it is not necessarily made of pork, although pork is the most frequent ingredient. 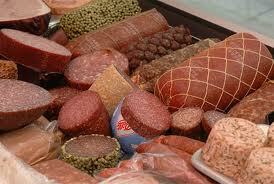 *Wurst is sold both raw and cooked; it can be sold as a sausage or as cold cuts. * Holzhausen, Germany boasts the Deutsches Bratwurstmuseum–yes, a wurst museum– which houses documents that can date the beginning of wurst from the year 1404. So there you go; plan your pilgrimage now. **If this is the wurst post ever, I apologize. Consider the subject. So sorry to hear that you’re allergic to pork. Quite a few restaurants offer turkey (Puten) Schnitzel and although I’m a pork eater I have had some great salads with turkey. Beef is usually a bit pricey but at least it’s an option. 🙂 We might just make it to Wurstfest in New Braunfels this year. My German husband has never been and I just think he must experience this festival 😉 and we’ll see what he has to say about it! Well, a pork allergy does cause some “navigational” hardship in German restaurants, but I certainly don’t suffer. Like I said, the chocolate,pastries, and schnitzel more than fill an empty plate. If you do make it to the Texas fest, let us know how it is–and what your husband’s reaction is! I know there is a lot of German heritage around New Braunfels, so hopefully the wurst will be up to standards! I’m with you on the chocolate and pastries, I have to control myself! Do you have a favorite chocolate or pastry?! Wurstfest is not bad but of course can’t be compared with the real thing. It’s a fun time and I will definitely report on my husbands reaction if we make there. The New Braunfels area is really nice and the Texas Hill Country too which also packs a lot of German history. I’m not averse to the odd Bratwurst (now and then) but since we don’t live in Germany it’s a treat rather than part of a staple diet – definitely sympathize with you! Are you in England? I remember lots of “bangers and mash” from my days in England, and “toad in the hole” was a favorite for kids. There was also a great local sausage maker just north of us in Yorkshire–my husband liked to visit his store. Of course, I steered clear and hunted out things like steak and ale pie instead. Love this post and your sense of humor! Thanks so much. Germany has been so much fun–we’re looking forward to a few years here. I loved your photos of Venice–it’s at the top of my “to do soon” list. Any tips of must see spots there would be welcomed. I have a lot more photos of Venice I’ll be posting this weekend! Tips: We were there in the first week of July, very, very crowded. I had to get up at 6am to go out and take pictures without a bazillion heads in them! The cruise ships come in and oh my! From 9am until 1pm was a disaster! I was surprised at Venice, it is mostly shopping, eating, and walking. It is very unique. Get tickets for Doge’s Palace and St Mark’s early so you don’t have to wait in long lines. Be it beef or pork, “es ist mir Wurst” (It’s Wurst to me) What means in German “I don’t give a damn” – Higly enjoyed this post. Thank you so much. I’ll have to incorporate that phrase into my vocabulary–I’m sure it will come in handy!